I didn’t go into the Ricondi store with the intention of buying any gloves, I was there picking up my new Kabuto helmet. It was a classic case of, ‘Well I’m here, I supposseeee I’ll have a look.’ In all seriousness, my current gloves had just split in the palm and I was due for a set. I was properly impressed by the quality of the gloves and ended up grabbing a set of ‘Racing Series’ gloves. Now I’m no expert when it comes to leather, but I’ve seen and used enough gear to know quality when I see it, and these gloves ooze quality. By just looking at them and picking them up, you can see they are made well. They are made of kangaroo leather with stretch panels, double Velcro wrist straps, have extra Kevlar on the palm and pinkie region, the ring and pinkie fingers are stitched together and wait for it, there’s stingray hide on the wrist and palm. Yeah thats right, stingray! These are a serious track glove and they certainly look the biz. I tried on several sets at the store and honestly another set, the GP Evo’s, fit me better, but they were slightly more road orientated. Since I’m going to be riding on the track, the owner Andrew suggested that the Racing Series would be a better option in terms of safety. After some umming and ahhing I grabbed a pair of medium Racing Series for a bit over $200 (retail is $245). My initial thoughts on the glove were they are light and as far as racing gloves go, comfortable. I have been using them to commute, and frankly after my first few times wearing them I was concerned, they were tight in all the wrong places. In fact they were so tight my hands hurt wearing them and the seams were leaving indentations. I rung up Andrew all worried, he assured me it was normal and they just take time to wear in. He was right, after a few weeks they improved drastically and are now comfortable. If you were to wear them purely as a track day glove, I definitely recommend trying to bed them in before hitting the track. Mine were initially quite cumbersome (not what you want on the track, or street really). I found myself struggling with the brake and throttle and had to strain my hand reaching for the clutch. Over time I have adjusted (and they have worn in) and now I have no major issues but it is something to be wary of. If you are looking for any motorcycle gear or parts, check out http://www.bikebandit.com. They have motorcycle helmets for sale and discount motorcycle tires. I’ve been browsing their site and found some cracker deals, especially if you are in the USA. By clicking on the links, you are also helping out OnTheBackWheel, so don’t be shy and get clicking! There are only a couple of things I don’t like so far. First up, the double Velcro straps aren’t long enough. To get them pulled together properly, I have to pull them tighter than I would like. If I wasn’t to do this, I feel they could come undone in an crash. A little more length would be appreciated (that’s what she said!). At times I get a sore wrist wearing these, more so in my right hand than left. Why? I am honestly not sure. It isn’t caused by doing the straps up too tight as it occurs either way. Also, when using the clutch lever, it can oddly strain my middle finger. I imagine this will get better over time, but its worth noting. On a sour note, some stitching on the right hand glove strap has failed and now the material underneath is showing. Here’s hoping it will be exchanged as they are still pretty well new gloves. Overall, the rest of the stitching and leather quality appears to be great. It might sound silly, but I love the stingray hide! It’s so unique and something I have never heard of being used in a product like this. So how do they hold up in an off? I personally haven’t crashed in these, but my mate Lance has. I asked him how they held up and he stated, ‘great.’ He did send them off for repair work as the stitching on the stingray was damaged. This was repaired with a leather patch. If I was to crash, I would have complete confidence in these gloves protecting my hands, and that’s whats important right? 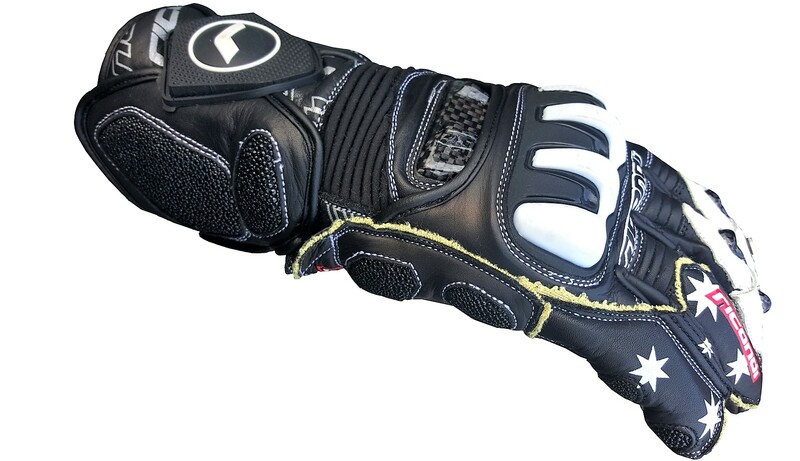 So, is this the best track glove you can buy? If you want to spend a zillion dollars on the likes of high end Alpinestars, Dainese etc, no. But in this price range they are great. I found the fit annoying to begin with, the damage to the stitching on the strap isn’t ideal and I would like some more feel in the fingers. Overall though, the gloves have have great build quality and features at $245. Oh, and they are Australian! Definitely agree that the velcro is too short! I wasn’t aware they were made in Pakistan, I only know that the suits are made in Australia. Thanks for the heads up!